The NBC Store is offering 5 items for $20 + free shipping today. Other shows are offered, like Heroes, House, and Saturday Night Live, as well as a few movies. Use promo code SHIP5FREE for free shipping; ends tonight, 11:59pm PST. I tried using the promo code and it said it wasn’t available for this order. Strike that, reverse it. When I added the “Mission Statement” magnet to my order, it got all jacked up, and wouldn’t let me apply the free shipping code. I added the Badge Holder instead, and it applied just fine. Beware, if one item doesn’t work, try a different item! 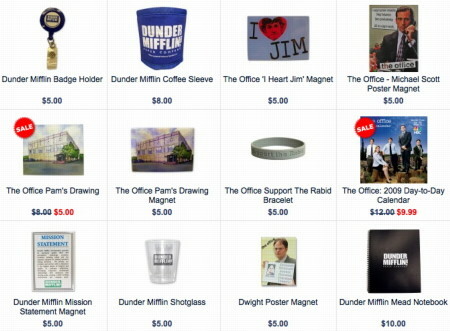 Tanster, there’s also a Vance Refrigeration magnet that isn’t listed in your pic but it is a part of the deal. Ok quick question: “House” is on Fox, right? because they’re selling House stuff in that link. Weird. Next PostNext The Office stars play ball!